The Educator Timeline View allows teachers with My BrainPOP educator accounts to see the progress of their students organized chronologically. 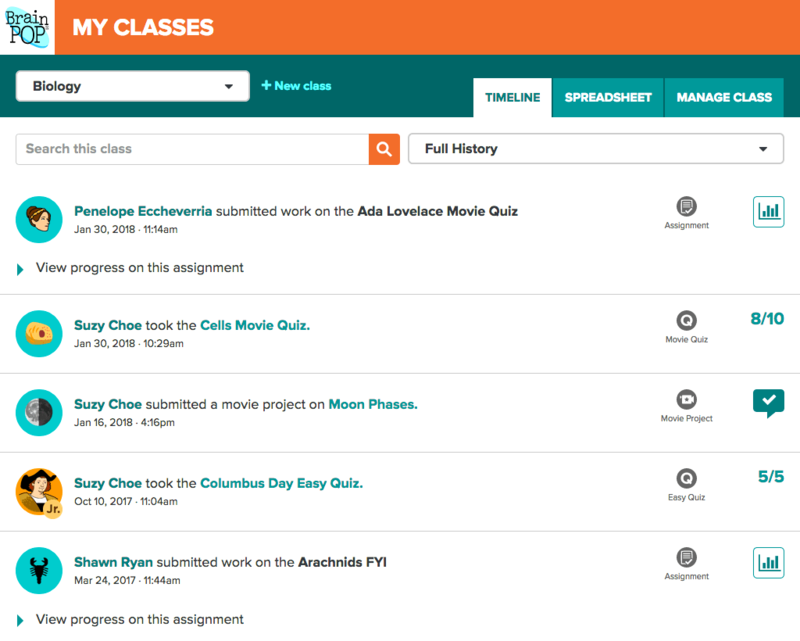 To view submitted work, log into My BrainPOP and click My Classes at the top of the screen. The most recent activities are at the top. You can tailor the information you view using the search bar and date range features in your timeline. After selecting the dropdown menu, you can filter by the last 12 months, last 30 days, or create a custom date range.You can search for work submitted on a particular topic or activity by a student. When students submit their work to teachers, it appears in the Educator Timeline view. A gray Assignment icon appears to the right of work that was assigned to the student. Unassigned work appears without the gray Assignment icon. Results of completed assignments automatically submit to the teacher. You can find assigned work indicated with a gray Assignment icon. To see how all students have progressed on an Assignment, click View progress on this assignment.